A beautiful swamp-dwelling antelope of the Tragelaphini or ‘Twisted Horn’ tribe of antelope, the Sitatunga or Marshbuck can be found in many countries of central Africa but is rarely seen due to its elusive behaviour. Females are fawn-coloured with vertical white stripes and spots across their rump to provide camouflage within dappled light. Males are larger, and chocolate brown with long, spiralled horns, a mane and white stripe down their spine. 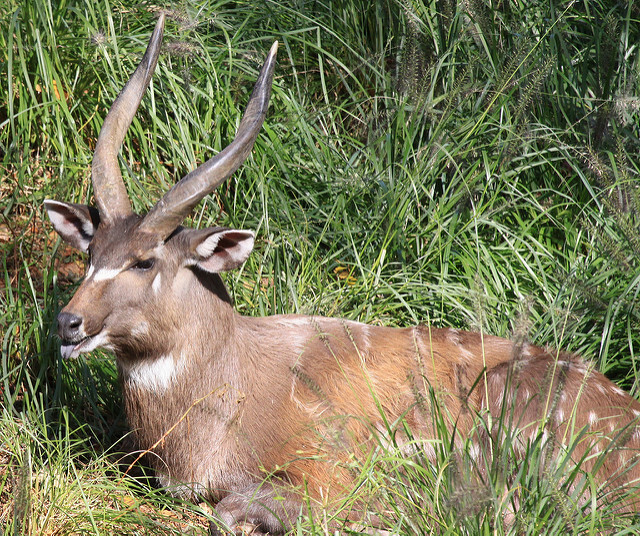 Sitatunga are crepuscular, meaning most active at dawn and dusk, but can be active in both day and night. They feed upon bulrushes, sedges and leaves of bushes, sometimes venturing out of the swamp to graze on grasses in riverine forests. They are known to be Africa’s only true amphibious antelope, with many adaptations to their aquatic habitat, such as waterproofing oil on their coat and elongated, splayed hooves for walking on soft soil. They use tunnelled pathways through tall reeds and papyrus to navigate through the swamps. 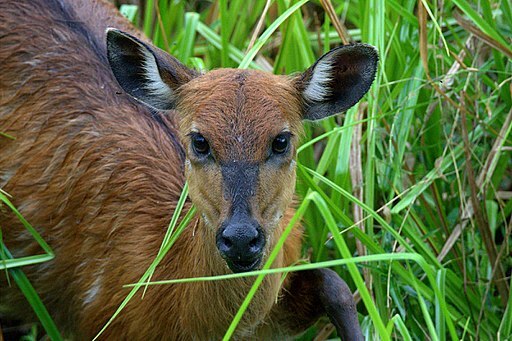 Sitatunga have small home ranges due to the abundance of food within their swamp habitat. They form paths through reeds and papyrus, and will create platforms of vegetation by repeatedly circling and trampling reeds and grass. They are excellent swimmers, able to move slowly through water for several miles, and will dive deep enough to submerge their entire body when escaping or hiding from predators, with only their nose exposed at the surface. Due to their specially crafted paths through swamps, Sitatunga are easy to catch by setting snares, which is causing overhunting to severely reduce numbers outside protected areas. They are hunted for bushmeat in West Africa and for trophies in northern Botswana. The loss of wetland habitats over their range has cut off dispersal routes and left populations in isolation. Land-use change in and around wetlands also affects the species, as water level changes will alter the vegetation structure, decreasing their food source.